I like where I live. The town I reside in is largely inaccessible and town power brokers detest the push for wheelchair access. I have heard many local people state that town buildings are more important than people. What I like is what everyone likes--the town is picture perfect and its location on a lake make it a great place to live and work. There are also great parks nearby and I am not too far from Syracuse campus. The draw is understandable. Yet I am thinking about moving. Why move? Flooding is an issue that must be addressed. It has been three months of repeated spring flooding that will be addressed July. For now, my floor remains a concrete slab. The fridge is terrible and I have lost a lot of good food as it does not stay consistently cold enough. Three of the four burners on the cook top do not work properly. There is no oven beyond my toaster oven. There is no washer dryer (the local laundromat is expensive and a social adventure). The drive way is very steep. I get a serious work out getting in and out of my wheelchair. In terms of my day to day existence, where I live is a logistical challenge. I have been looking around for a new place. This search is frustrating. 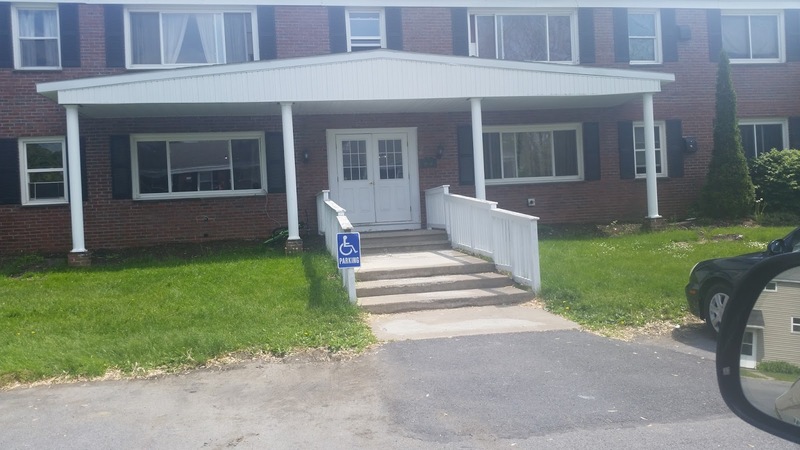 Living in down town Syracuse or within walking distance of the university is not an option. Houses in the area are old and not remotely accessible. The larger homes near campus have been cut up into small rental units. Students abound as do the elderly. For practical reasons I get why many people who use a wheelchair would not live in this area. It is bitterly cold in the winter I am in the snow belt. It is also too expensive to live in most nice areas. The slums of Syracuse are dangerous. Crime and poverty abound. What draws me here? The university. I am also drawn to the winter weather. I love the cold and snow. I love the long harsh winters. Central New York is gorgeous and the locally grown food is spectacular. Corn season is a joy and small farms abound. Back to my search for a new place. I have looked on line and taken to the road. I have looked at dozens of places. Almost all rental units are inaccessible in one form or another. I have gotten good at filtering out the grossly inaccessible rentals. Google maps is a time saver of epic proportions. I now reduce my search to units listed as "wheelchair accessible". This eliminates about 97% of rentals. I have quickly learned that even those listed as "wheelchair accessible" are not in fact accessible at all. Most of these units have what I would call "old people access". The assumption is a person has limited mobility. I visited such a unit the other day and had a remarkable conversation I cannot get out of my head. Here is the "wheelchair accessible" unit. Based on my experience, this is the norm when an apartment is listed as "wheelchair accessible". When I balked and stated the entrance was far from wheelchair accessible the person I met was perplexed. He said "Just walk up the steps and I will carry the wheelchair for you". I replied "I cannot walk at all". The man appeared stunned. In recent years I have heard variations of his reply. Once the man regained his composure he asked: "Can't you walk just a little bit". I replied "no". I could see this man was thinking hard. "Well", he said. "I think we can find someone to carry you in and out when you need to of out". Now I am stunned. I state "That will will not work and is against the law". He mumbles something about lawyers and asked me if I was new to the area? I reply "no". He looked even more perplexed. "You must be new to the area. You could not live here in the winter." I replied "I have lived through two Syracuse winters without problems". He now looks around as though he is being pranked. He tells me "That is not possible. No one using a wheelchair and unable to walk could survive the winter". I thank him for his time, assert the entrance is not accessible, and it should not be listed as such. I then wished him well. He stared at me in disbelief as I got into my car. The above exchange was out of the norm. However, it did highlight a few things for me. First, establishing a sociopolitical link with elderly people is impossible or will at best take decades to form. The elderly fear disability and many struggle with adapting to long term deficits. The elderly do not embrace disability as an identity or perceived themselves to be an oppressed minority group. Their standards for access assume a limited degree of mobility exists. The lack of mobility is linked to a lower quality of life. Second, few rental agencies or people privately renting out an apartment know a thing about access. Many so called "wheelchair accessible" units are not remotely accessible. Many rentals advertise an "accessible room" or "grand parent suite". This usually entails a basement room accessed from the back yard and is as a result accessible in the summer. There is no accessible bathroom or kitchen. Again, the assumption is the elderly person has some mobility and will only visit for short periods of time. Third, people are clueless as to what is accessible is. Thanks to the media one and all assume any adaptations costs a fortune. Ignorance abounds and accessible is solved by creating handicapped parking with the blue wheelchair logo. Yes, access can be resolved with some blue paint and a sign. No one it seems thinks beyond the paring lot. Fourth, disability is individualized. The lack of access is dealt with on a case by case basis. People with a disability are not an oppressed minority group but rather a problem. When I frame disability as a matter of civil rights most people with no experience with disability get angry or tell me I am an extremist. I doubt I will move. The more I look at other places where I live is looks better by the day. What gets me is the ignorance. I want to know why, 25 years post ADA, people do not know and complain about barriers to housing, mass transportation and employment. What do our secondary schools teach about disability? My gut reaction is not much of anything. I fear what kids and adults soak up culturally is that disability is bad if not a tragedy. Segregation in the form of education, transportation, and housing is acceptable. Special education kids get shunted off to the special short bus and educated in resource rooms. Adults think equal access is too costly and ugly. Budgets are limited and we must do what is best for the largest number of students. Oh, I have heard this a million times. The net result is in area like Syracuse wheelchair access is an after thought. If someone does ask about access we, out of the goodness of our souls, will provide that highly unusual individual with a means of entry or inclusion--provided it does not cost too much. The net result 25 years after the ADA was passed into law is that 97% of housing in the Syracuse area is not accessible. I have damn good reason to be angry and I object. The current lack of housing options is unacceptable. I just wish others, bipedal others, cared. A few do of course but not many. Middle, There are a few studies being done that focus on the experience of children who had a parent with a disability. I look forward to reading this research. I suspect we were among the first group of parents with a disability who raised children. A neutral way of saying we were pioneers. My son and I have talked about his experiences a lot. He thinks having a paralyzed father was in the long run a good experience. He thinks he learned much about social justice and civil rights. Like your kids he learned how to hold his ground in a polite but form manner. I believe our girls would have been pretty good people anyhow but they are different from their friends. I never felt that they felt deprived in any sense of the word...actually they tell me now that they were happiest when we would shut the outside out and just be together in the house or on a drive because we could really be ourselves...not that they weren;t...Don could be pretty outrageous with a really black humour which I enjoyed (sometimes) but which the girls picked up. Although they loved him deeply and he them each gave no quarter in many ways but should something go wrong they were quick to act...one time when Alison was only five and very small the manual wheelchair which they should never have sent Don home in got away from me when my shoes slipped in water - on an incline. She was in front and turned and put her whole body in front of the chair which luckily wasn't going fast - and I caught it... and things like this happened on occasion throughout the years. Another one I recall was when Don's electric chair malfunctioned and went round and round until he was pinned up against a wire fence she about 11 disengaged the power source, somehow got the chair out of the wire (with Don still in it) and pushed the whole thing and Don up the incline into our house...a real frightening event for them both but when I got back with the groceries they were both laughing about the whole event and that was the key really...when the dangers were over; when the black things that were said and done re my husband and the chair and all of that the four of us could always be found laughing about this or that pompous person or crazy event. He taught them both to swim just by telling them what to do and patiently being there all the time they learned - i was in the house and could be there in a flash; they learned pretty quickly never to say they were bored or he would offer to show them the back garden which needed weeding... the girls describe their childhood as being rich... of course for all would have been better had Don not been injured but that it happened our family for one took the best out of it if this makes sense...not to say there weren't a few bad times we all have them. Good morning. I confess myself befuddled. How Could it Possibly have escaped his notice that his "wheelchair accessible unit" has 3 stairs??? I have to laugh (before I start crying). HAHAHA! In my travels around, it has also puzzled me that what passes for ADA compliant is many times lacking in actual day to day, rubber meets the road, accessibility. In my opinion , never have theory and practice been so divorced from one another, and yet we are expected to make do. Oy,vey.